Now optimised as a 64-bit application (no more pesky System.OutOfMemoryException errors). Monopole openings can now be viewed in section and elevation. Improvements to Type 4 opening reinforcement. New automated Topographic Multiplier (Mt) detection algorithm to AS/NZS 1170 (more on that below). 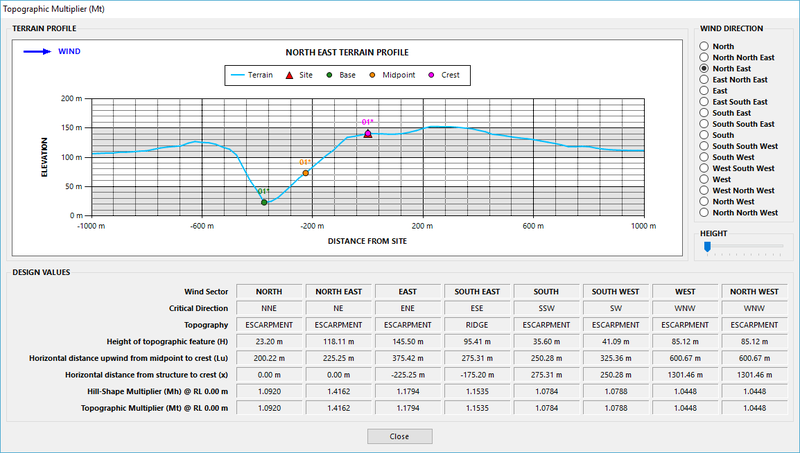 Users can now override Topographic Multiplier (Mt) values. Introduction of our own Basic Wind Speed maps to TIA-222-G and TIA-222-H. Improvements to automated Exposure Category (Kz) detection to TIA-222-G and TIA-222-H.
New automated Topographic Factor (Kzt) detection algorithm to TIA-222-G and TIA-222-H based on Crown Castle and SEAW RSM-03 guidelines. Improvements to fatigue design to AASHTO 2013. Until now, CHECKPOLE has used a combination of the 500 m segment criteria from the AS/NZS 1170.2 commentary (though with a “rolling” 500 m segment instead of less accurate 500 m increments from the crest suggested by AS/NZS 1170.2), in addition to our own local minimum criteria to determine the base of a feature. However, the problem with utilising the local minimum criteria is that the base might be determined as being at the bottom of a valley with a steep slope for certain terrain, leading to overly conservative Mt values, as shown in Figure 2. The local minimum criteria was intended to avoid situations where the 500 m segment might identify the “base” as being halfway up/down a slope, which seemed counter intuitive. Regardless, we’ve adjusted the algorithm and removed the local minimum criteria and now rely solely on the 500 m segment method. This has led to an overall reduction in Mt values across all of our test sites, as shown in Figure 3.